Those red, juicy little things! That tantalizing tangy taste makes cherries irresistible, especially when you are craving during pregnancy. They soothe the taste buds and tempt you to eat them unendingly. But are cherries safe to eat during pregnancy? 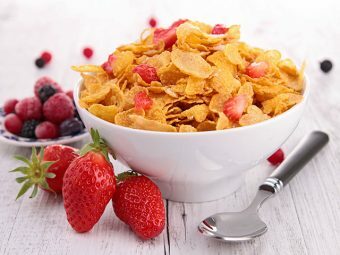 Or is it one among the several ‘don’t eat’ foods? MomJunction answers your questions by sharing the benefits and side effects of eating cherries during pregnancy. Also, do not miss some tasty recipes at the end. Is It Safe To Eat Cherries During Pregnancy? Yes. Cherries are full of nutrients, and they are safe to eat unless you are allergic to them. The pit is the only part that should not be eaten. Also, do not over eat them as they can create gas and cause bloating. Eating cherries moderately is absolutely fine and do good to your body. Cherries contain healthy levels of vitamin C, which have antioxidant properties. They play a vital role in removing the free radicals, which can cause various infections and diseases. Moreover, the immunity levels remain low during pregnancy. Cherries can boost your immunity levels. Anthocyanins found in cherries protect neural cells and promote brain health of the fetus (1). A new variety, Balaton cherries can help you in preventing pregnancy brain (bouts of forgetfulness during pregnancy). Anthocyanin, the red pigment in cherries, is known to be very effective in reducing the inflammation, swelling and joint pains that you usually experience when you are pregnant. Cherries help in keeping the blood sugar levels under control and thereby assist in preventing gestational diabetes. Loaded with excess water content, cherries, on regular consumption, give an energy boost, and help keep fatigue away. The potassium content in cherries works towards water retention and blood pressure control in the body. It, thereby, prevents the risk of preeclampsia during pregnancy. The antioxidant called melatonin, which is present in cherries, is an ideal sleep inducer. You can have a disturbed sleep during pregnancy due to various discomforts. Drink a glass of cherry juice every day to overcome sleep disturbances. Tart cherries contain more antioxidant than sweet cherries do. Vitamin C present in the cherry fruit strengthens the blood vessels, helping them to pump enough blood to the fetus. Cherry is a useful expectorant for treating all the cough related conditions. It helps to relieve cold, cough, bronchitis and asthma. Cherries contain high fiber content. They normalize the bowel movements and help you get rid of constipation that is one of the most common problems during pregnancy. If you are careful about weight gain during pregnancy, cherries are the best fruits to consume as they are extremely low in calories. Cherries are anti-inflammatory in nature and therefore offer effective relief from muscular pains and issues you may experience during pregnancy (2). Doctors believe that estrogen hormone fluctuations, and preeclampsia conditions during pregnancy cause migraine headaches. Cherries contain anthocyanins and bioflavonoids, which help in mitigating migraine headaches. Aren’t these benefits more than enough to include cherry fruit in your pregnancy diet? But do they cause any adverse reactions as well? You may know below. 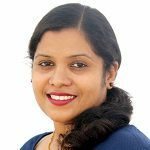 Are There Any Side Effects Of Eating Cherries During Pregnancy? A few pregnant women suffer from bloating, gas, and abdominal pain after eating cherries. Eating cherries can trigger allergic reactions in some women. If you feel any significant discomfort after consuming cherries, please seek your doctor’s advice immediately. The leaves, bark and fruit pits of the cherry plant contain hydrocyanic acid, a poisonous chemical. Therefore, eat pitted cherries only (3). If you have gestational diabetes, do not eat cherries. Wash them before you eat to remove bacteria and infections. Consult your doctor before you add cherries to your everyday diet. 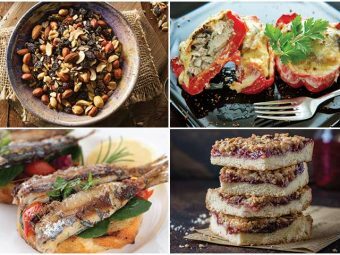 Here are some interesting cherry recipes you can make at home and enjoy the delicious treat. This is a classic French dessert, a combination of flan and pancake. It is traditionally made without pitting the cherries so that the pits give some almond flavor to this dessert. But, unpitted cherries during pregnancy is a big no-no. So here’s the recipe with pitted cherries. Mix milk, eggs, sugar, vanilla extract, salt and flour, and blend all of them. Butter an eight-cup baking pan, and add a layer of about one-fourth inch blended liquid in the bottom. Keep aside the remaining batter. Microwave it for about seven to ten minutes. You will see a thin film of batter on the top even though the mixture is not cooked. Remove it from oven and do not turn off the oven. Arrange the pitted cherries on the set batter, sprinkle some sugar and add the remaining batter over the cherries and sugar. Place it in the preheated oven and leave for 45 to 60 minutes until the cherry clafouti turns brown and puffed. Sprinkle the remaining sugar powder and eat the dish warm. The delicious dessert can be whipped up in no time. Add the cherries and blueberries into a blender and churn to form a smooth paste. Now add the yogurt and blend once again. Refrigerate until required and eat cold. 1. Can I have dried cherries during pregnancy? Dried cherries are safe to consume while pregnant. But if you are allergic to sulfites, then you should be careful because sulfites are generally used as preservatives in dried fruits. Therefore, check the label. 2. Can you eat maraschino cherries while you are pregnant? Maraschino cherries are sweetened, preserved fruits made of light colored varieties like Gold, Royal Ann, and Rainier cherries. You can eat them but in moderation. Cherries are tasty. They are healthy and easy to eat. Why wait then? Go ahead, satisfy your taste buds and reap benefits too! But before that, talk to your doctor and make sure that you are not allergic to the fruit. Did you eat cherries in your pregnancy or tried a new cherries recipe? Do share it with us. Is It Safe To Eat Grapefruit During Pregnancy? 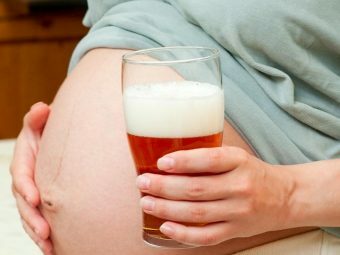 Is It Safe To Drink Ginger Ale During Pregnancy? 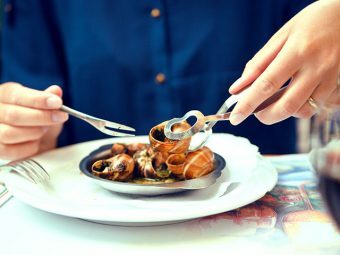 Is It Safe To Eat Escargot During Pregnancy? 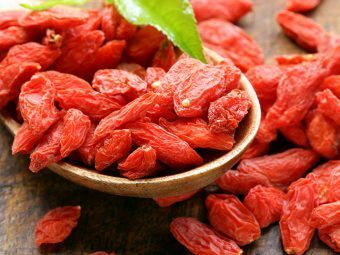 Is It Safe To Eat Goji Berries During Pregnancy?